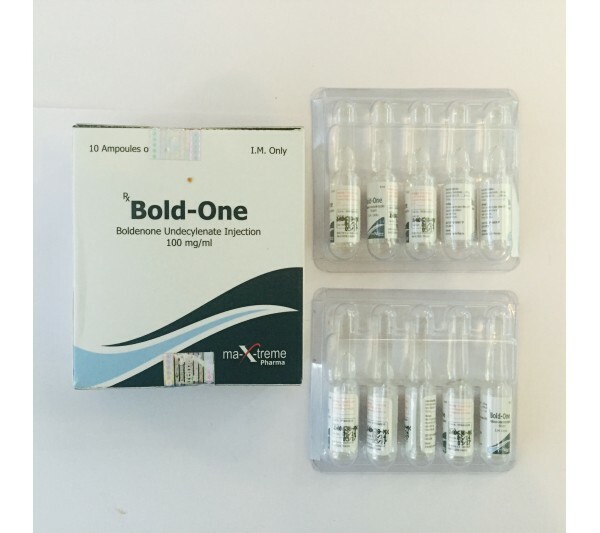 Boldenone Undecylenate Bold-One is an anabolic steroid developed for veterinary use. The drug was created as a long-acting version of Methandrostenolone, but the result was a steroid that has completely different properties, despite the chemical similarity of the molecules. Boldenone is a Dianabol molecule that is devoid of the 17-alpha methyl group (this part of the molecule makes it possible for Dianabol to pass through the liver without breaking). If we compare the effectiveness of Boldenone Undecylenate and Dianabol, the results obtained in weight gain and increase in strength are almost the same. Bold-One 100 mg is chemically a testosterone molecule that has a double bond between 1 and 2 carbon atoms. This modification made Bold-One 100mg as powerful as testosterone for its anabolic properties, while the androgenic properties of the drug are twice as weak. However, practice shows that Bold-One 100mg produces lower results than an equivalent amount of testosterone. The effective dosage of boldenone undecylenate starts with 400 mg per week — it can be shown to beginners. More "advanced" users of pharmaceuticals can use 600-800 mg of boldenone undecylenate per week. But the highest return from the drug can be achieved at a dosage of 1000-1100 mg per week. Boldenone can also be recommended for women, but only at a dosage not exceeding 100-200 mg per week. Despite the fact that boldenone undecylenate remains in the blood for a very long time, in order to maintain an even level it is worth giving injections once every 7 days. The usual concentration of the active substance in the solution is 50-200 mg / ml; concentration should not exceed 250 mg / ml. Boldenone should not be used alone for the reason that was mentioned above. The optimal combination during weight gain is with testosterone. During preparation for a competition, boldenone is usually combined with trenbolone, oralturineball, stanozolol. The suppression of the secretion of self-testosterone at low doses for 3-4 weeks cannot be called significant; after the cessation of the course possible rapid recovery of secretion. A noticeable decrease in libido when using "solo". Increased blood viscosity. Perhaps the appearance of acne.